Shaving your legs, tweezing your eyebrows, waxing body hair- these are all routine upkeep tasks for ladies. Getting rid of unsightly hair and having silky smooth skin is what females spend a lot of time, effort, and money on. But some women also have facial hair to deal with. While we all have some amount of facial hair, the growth is more pronounced for some. So what is a good solution to hide embarrassing facial hair? One of the things you could do is cover facial hair with makeup. Provided you know about the right products or natural ingredients, and the right way to use them, you should have no trouble covering up any unsightly facial hair with these four makeup tips given below. Use a full-coverage foundation. Choose a shade that matches your skin tone as closely as possible (pick a shade slightly lighter than your skin tone). Knowing how to apply foundation properly for effective coverage is probably even more important than the kind you use. 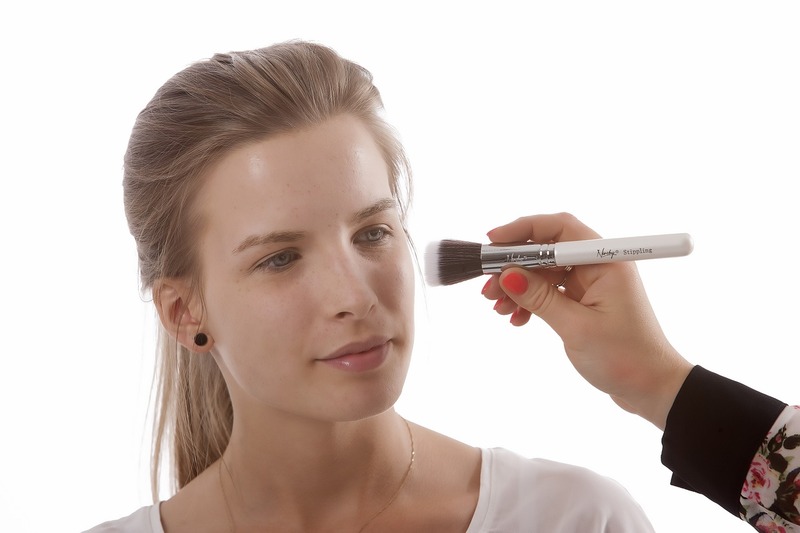 Brush the foundation onto the skin, working in the direction of hair growth. Blend well. Using a primer can do the trick. Either using a spray-on primer or a liquid one, will make your facial hair lie flat against your skin, making them much less visible. Wipe in downward strokes to make the hair “sit down” or lie flat against your skin. You can apply the primer after dabbing on a moisturizer, and forego using any more makeup. This works especially well for those with light facial hair. A cream concealer works best for the upper lip. If you have more than a light peach fuzz on the upper lip, work in a concealer to hide the hair. Choose a shade slightly darker than your skin tone, so that the darker hair can be hidden easily. Layer the concealer and press it down to get a thick, even coating. Blend well to remove edge lines. If you have any light and sparse facial hair, apply concealer to the affected areas, and then put on your makeup as usual. This will effectively hide it. Natural products can help lighten facial hair too. Your kitchen and pantry can have a lot of natural ingredients that can help to lighten dark facial hair. A mixture of freshly squeezed lemon juice and honey, for example, can be applied to the face for 20 minutes as a mask. Lemon has bleaching properties and since the ingredients are all natural, your skin will not be harmed by using them over and over again. Similarly, other ingredients such as a papaya and milk mask and tomato juice mask can also help lighten facial hair. Remember, it will take several applications of any of these for you to see results. So as you can see, with a few simple ingredients or products, all it takes is a few minutes to effectively cover up any embarrassing facial hair. You don’t have to think about more extreme or expensive solutions for this issue.